Usually creepy crawly things don't really bother me. Often I pick them up and investigate them, but there was something about this bug that made me keep my distance. Maybe it was because the thing was gigantic - over three inches long. (Those paper clips a the jumbo sized ones, not the typical-sized paper clip.) Then again, it could have been those huge eyes. I swear the thing moved its head and watched my hand every time I opened its box. It also could have been its giant arm-like legs. It held them open - like it was just waiting for an opportunity to latch onto my finger. Two of my students knew what it was, "It's a toe biter. We see them sometimes in the Grand Pool. Well, not ones thaaaat big." I refused to touch it, and I'm glad I did (I wouldn't let the kids touch it either.) 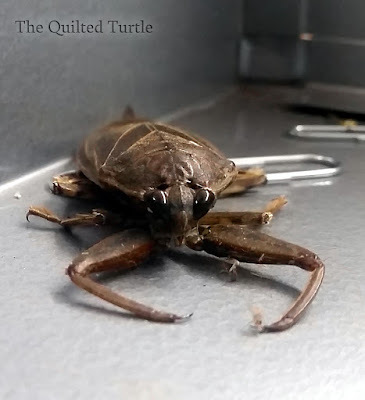 Apparently there are five species of these giant water bugs that can be found in Michigan and they do bite. They inject toxic saliva that liquefies the tissues of their prey and causes paralysis. I kills the prey but we're so big, their bites just hurt like there's no tomorrow. Check this video out if you're curious. (Skip ahead to about 13 min 30 seconds if you just want to see him get bitten.) And for the record - ours was every bit as big as that one.